Hundreds of thousands of pounds have been confiscated from a Wiltshire man who ran an illegal waste operation leading to a serious fire at one of his yards. Lee Averies is serving a five-year ban from the waste industry after environmental offences at sites in Swindon he operated with his brother, David Averies, and another one in Calne. 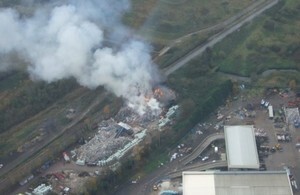 The yard at Marshgate in the town suffered a significant blaze in 2014. At Swindon Crown Court on Monday, the Environment Agency recovered £200,000 for the taxpayer from Lee Averies under the Proceeds of Crime Act 2002. He could face prison if he doesn’t pay up within three months. Judge Jason Taylor QC ordered Averies, 49, of The Marsh, in Wanborough, to pay a contribution of £15,000 towards the Environment Agency’s legal and investigation costs. His company, Calne Aggregates Holdings Ltd, currently in liquidation, was given a nominal penalty of £1. The court had frozen seven personal and business bank accounts linked to the waste dealer at an earlier hearing, after an application by the Environment Agency. The Environment Agency will do everything in its power to prevent waste crime and punish those who profit from it. Our extensive investigation found companies linked to Lee Averies earned significant amounts of money from stockpiling waste, and failing to exercise proper controls over the sites. He benefitted personally. We have ensured neither Averies nor his businesses operate any permitted waste sites, or become registered waste-carriers, such as providing skips for hire. Averies remains subject to a five-year criminal behaviour order, preventing him from any involvement in the waste business until 2021. In the past four years, Environment Agency officers have worked with other agencies like the Insolvency Service and the Traffic Commissioner, which oversees HGV licences, to investigate other offences. David Averies was fined and ordered to pay £50,000 in costs by the court in 2016.